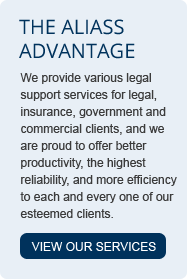 At American Legal Investigations & Support Services (ALIASS), we know that your business moves at a fast pace and we strive to provide the most efficient services possible. When you request a legal support service, a new service record is created in our state-of-the-art service database under your account and your case details are carefully documented. This new service record becomes the central source we use to manage your service request. Our staff will use this information to start the requested service (or to schedule additional legal support services if needed), and you can also access the status of your service request at any time from any internet-connected computer by logging into our secure ALIASS Client Portal. Through this portal, you can find out when we received the documents, the date and time of service, who was served, where it was served, the description of the person served as well as view and download copies of documents pertaining to your case, including all received client documents and payments, affidavit, and client invoice. And we know you are busy so we also send automated email notifications of status updates to keep you apprised of case progress. 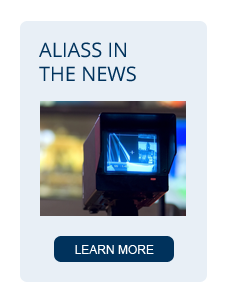 Our process is just one of the ways to show ALIASS is committed to providing reliable support and excellent customer service as your trusted legal support services partner. 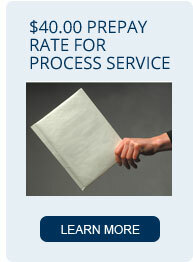 To view our portfolio of available legal support services, please visit Our Services.